I was on vacation for the week before Christmas, and then over Christmas and New Year I didn’t get much work done either (or any really), but now I’ve finally started working on the level design again. Patrick had made a first draft of an intro/tutorial level, so I decided to start off fleshing that out, and then working on a first level. Pan wakes up (from the floor) in a small cave. Above Pan, he can see the controls (floating in mid-air? on a poster of sorts?). Above him to (not directly, it shouldn’t imply that he fell down from it) he can see a vine/ladder/?? which leads upwards, however it is out of reach of his jump (there could be an indication that THAT is the way he has to go (like an arrow pointing up)). a bit to the left of the opening, pan can see a box being held by something (I’m imagining claws like one of those game machines where you can grab stuffed toys etc., however we should look for something candy related). A bit further to the left, in sight of the claw, pan finds a lever, which will open the claw and drop the box. Pan will push the box to the vine, jump on it, and be on his way. Then I started drawing it, even if my drawing skills are terrible, because I thought it would help me to give it exact dimensions instead of rough ideas, which it did! I used PaintDotNet, a tool that is somewhere inbetween MSPaint and Gimp in terms of power, but easy to use and enough for me anyways. I started drawing the exit of the level, then slowly drew the cave larger so there is room for the box and the lever to the left. 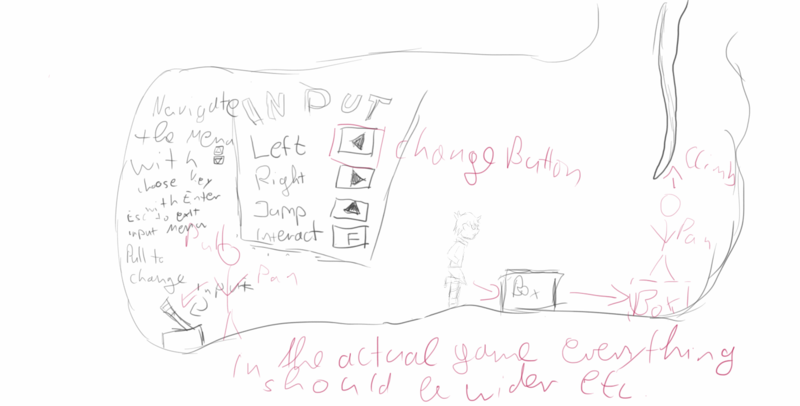 I drew in a cross that shows the (rough) screen dimensions and moved it around the level to make sure that the starting screen shows the full controls, and the exit. Then I moved it further to make sure that the player can see the box drop from the claw when they interact with the lever. I used some different colors, and intend to keep that color scheme for later level mockups, to help seeing the important things in the level. Before working on the first level, I did some research on puzzle games (again), and learnt from one video, that “a puzzle has to make the player stop and think”. According to this video, the right order of events is “player sees obstacle > player thinks about > player finds a solution”. Although this should be obvious, I hadn’t thought about that yet, so now I had something to keep in mind! 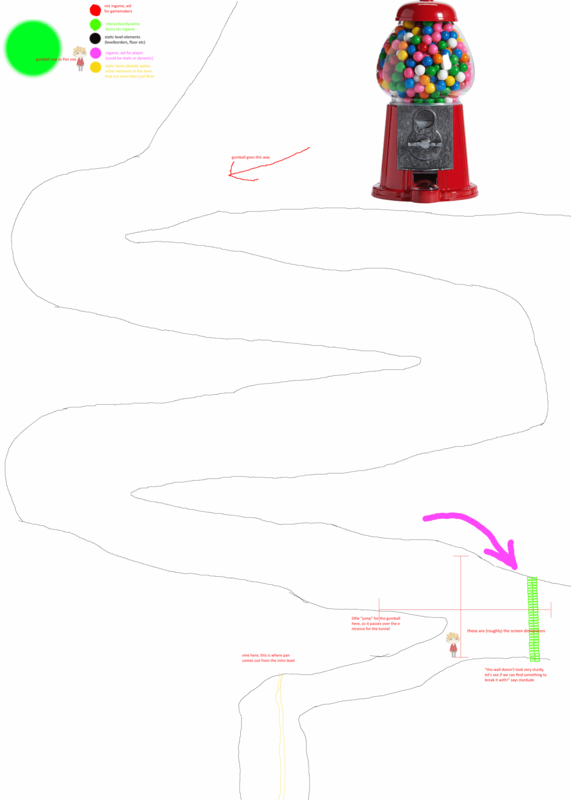 So revisited the first level that we had started thinking about before, which was not much more than “gumball rolling down a slope to break through a wall, after that something with Mentos and a Cola lake”. I now realized that just triggering the gumball machine and the gumball breaking through the wall would be no puzzle, because all the player did was interact with everything they can, instead of thinking about what it is that they’re doing. I went back to writing things down before drawing again, because that worked pretty well for the first level. After that I started drawing. I took the intro level file, and took the screen dimensions from it. Using those I drew a cave entrance, a bit lower than the screenheight. I drew a “brittle wall” in it which would have to be broken by the gumball later, and then made a connection to the intro level. For now I just drew some slopes up, and put a gumball machine at the end, but I will work with the rest of the team on monday to finalize the level designs.